I loved my first home economics class and also kind of hated it. The recipes for beginner cooks used basic ingredients and involved minimal skill and preparation. While I learned things that I craved to learn, I was also constrained by the slow and methodical way the class was taught. I certainly did not need to be instructed over and over how to measure and how to clean up afterward! In hindsight, however, that repetition was probably a good thing. After those classes, I could be counted on to measure accurately and I always make it a point to clean up as I go along...less mess...less mistakes. This recipe could have been a part of my first home economics class as it is easy to measure and prepare. The mixing is simple and can be done with a fork and the cooking is done on a griddle or frying pan. 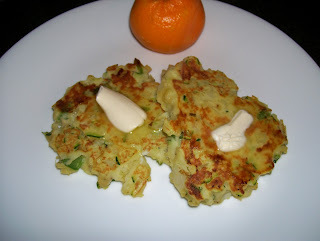 Zucchini Patties is a very satisfying and tasty dish and might even bring some vegetable haters to the table. In a medium-sized bowl, beat eggs until frothy. Add remaining ingredients and mix until well blended. Heat griddle and coat with non-stick spray. Divide patty mixture into 7 or 8 portions and spoon onto griddle. Press each portion down to make a pancake shape. Fry until golden and flip over. Remove from griddle when second side is nicely browned. Serve with butter or margarine.